Salvage operations… – Nice dress! Thanks, I made it!! After sewing my Motor City Express jacket for possibly the whole of last month, I decided to tackle the small projects lying around next. Mending, shortening Mr. G.T.’s shirt sleeves from long to elbow length, and salvaging a few garments that I have made but don’t wear. Like many I have had a few Me Mades that turned out perfectly fine, BUT were not perfectly fine on me. 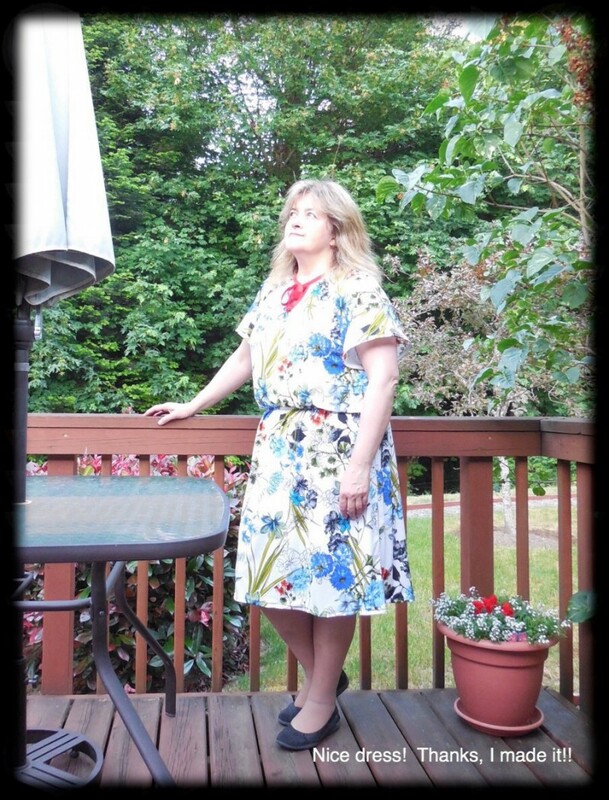 Perhaps you remember this dress, blogged about here, a vintage pattern, Butterick B4598, which I made last August 2014. I love colour blocking and this is a really nice vintage pattern. Unfortunately, when I wear this dress I feel short, really short! It’s too long and I think I need some waist line definition. It has been hanging in the closet, unloved, ever since. Or there is this more recent dress I blogged about here. It’s McCall’s 7238, another vintage pattern. I loved the print on this fabric, but the fabric was very light, as light as a tee shirt fabric. I know that if it looks good on the model or the mannequin or on the pattern envelope or on someone else – it might not necessarily be the style for me. I know that just because the fabric has a pretty design or the perfect colour – the design or colour might not be suitable for me. I know that I should consider the drape and weight of the fabric – as they might not be suitable for what I have planned. But hey! You know, sometimes I can’t see the forest for the trees. To salvage these two garments, I re-made them into tops. I cut some fabric strips from the remnants of this dress. Pinned and sewed them together to make self made bias tape. The excess “triangle piece” was cut off and the bias tape was flattened out. I sewed the bias tape on to the bottom of my hem – right sides together. I used Wonder Tape to hold the pieces together until sewn. I ensured the beginning of the bias tape strip was folded over to make a clean finish on the bias tape when it was turned over to the wrong side. I finished sewing the bias tape on. The bias tape was folded over and pinned. I used my blind hem foot to “stitch in the ditch”. My flowered print dress was even easier to salvage. I took out the elastic waist band, shortened it and re-hemmed it. So come on! We all have them. I know I’m not the only one! What was your last garment that turned out perfectly, but actually didn’t? Well, back to cutting. I am cutting out the fabrics for My Sister Project. Boy, am I anxious to start on her garments! It’s nice to have the choice, isn’t it. Whatever works! 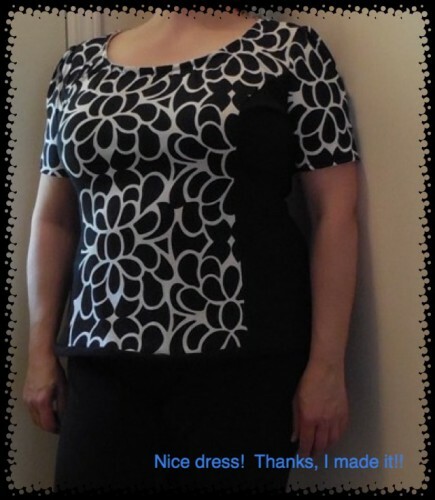 I have a lovely Burda that came really nicely, and I used the fabulous heather purple lace that is flocked. It’s soft and beautiful, but not flattering to wear at all! Have been pondering making it a top. I’m glad to not be the only one with failed successes!! Exactly! Sometimes the pattern is lovely or the fabric, or I put so much work into it, I just can’t part with it! Your purple lace must be beautiful! Good job! They are so versatile now. And both look very comfy. Thanks! I am happy I could save these. I love it when I can save an item that I would never wear! I especially like your black and white top. Thanks, the black and white, being more fitted, is suitable for work. The flowered one is loose and comfy, suitable for these hot days we have been having. I especially like your black and white alteration. I’ve got a few items which need your magic touch! Haha! It’s easy enough to do with these. The whole time I was thinking “What the heck is going to happen when I blow it making pants (trousers)!” I guess I might just have a couple of pants muslins sitting around! It’s nice to take a break from the big projects and regroup with the simpler projects 🙂 The tops look great! Thank you! I’m going to have to come over and take a peek at your refashions. I was thinking about you when I was re-doing these! Good luck on the contest. Your gingham and lace is fab! Lovely revisions on these – congratulations! Had a couple of dresses I cut down to skirts earlier this summer, and currently have an op shop top I’m fitting a bit for cooler weather… if that ever comes! Thanks! Yes, the skirt option is always a possibility too! Hope your weather behaves soon! Thanks, I’m going to have to look up “Boss Lady”, she sounds like a smart cookie! Thanks, oh there are a few that end up in the charity shop too, usually the ones that don’t fit me anymore! Love your refashions. I have a couple of me-mades in my wardrobe, crying out for something to be done about them. It’s so easy to move onto the next thing, but sometimes we just need to made good use of the clothes we’ve already got. Thank you. And very well-said! Brilliant remakes! I love the black and white top on you, not to mention the color blocking is outstanding! I have several ‘makes’ hanging in my closet too that are just not right. Your post makes me wonder how I can ‘save’ them. If the fabric is great, it’s hard to give them to charity…. It is hard to give away what you make! I still have fabric set aside for another black and white colour block dress. I’m hoping for more success with a different pattern! Thank you for posting this. Someone suggested this to me recently with an unflattering dress and I haven’t been brave enough. Cutting a dress into two is a hard decision, but it has worked out really well. Thank you. If it had been something that I made that turned out perfectly fine, except maybe it didn’t fit me or the colour was not mine after all. I would have happily given it to a charity shop for someone to use. But then again, when I don’t like what I have made for whatever reason AND I just can’t part with it for some reason, I just have to cut into it and see what I can do to make it wearable for me. So now I still have my lovely colour block and my flowers and I have learned something while making those dresses too! Great way to salvage your projects! ! I applaud you all because I HATE picking things out. I have had great looking outfits that belong in someone else’s closet but have never worked up the oomph to pick apart and rebuild. Once again, good on you all for your patience and creativity. Well, on behalf of everyone you are talking about … Thank you! Great transformations, and like you I do this all the time, I so rarely wear dresses that I sometimes wonder why I even buy them!? Good for you! I can’t imagine any item of clothing ending up in a landfill. There must be something you can do with it! What a great idea. They’re lovely, especially like the black and white one which looks classy without being too formal. Thanks! Yes, it’s better for work, the flowered one for lounging around in the sun! Both tops look great on you, what a nice re-fashion! Hi, I found you in the comments at Pretty Grievances. It just so happens that I blogged about a “salvage operation” a couple of days ago. I have several more that I need to do. If I can find you, I’ll come over and have a read! I found you. Liked your post. I commented too, hopefully it worked… Sometimes it doesn’t!